“The old farm home is located just south of the Old Lois town site, and west up a dirt lane. The deserted home was poorly remodeled in later years and it is now hard to imagine it’s original charm and dignity. 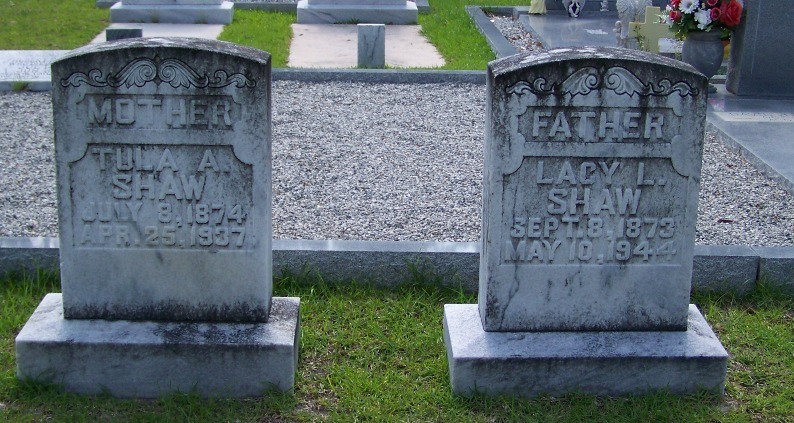 Two of the sons of Francis Marion Shaw married daughters of M. Hodge Albritton. Francis Arthur Shaw’s second wife was Gertrude Albritton, and Lacy Lester Shaw married her sister, Tula. In the Lois community, Matthew Hodge Albritton was a neighbor of Noah Webster Griffin and Lillian Melissa Knight, Molcie Parrish – wife of Elder Ansel Parrish, and Sovin J. Knight, among others. Matthew Hodge Albritton was born March 8, 1842 in Houston County, GA a son of Allen and Rebecca Albritton. His parents were well off. By the time of the Civil War, Allen Albritton had amassed a net worth that would have made him a multi-millionaire by today’s standards. Allen Albritton, was a farmer and owned land in the 5th District of Houston County, number not known, and adjoining the land of Stephen Castellow and others. Matthew’s siblings were Littleton L. Albritton, Mariah Albritton, Mary Jane Albritton, William M. B. Albritton, George A. Albritton, Wright M. Albritton and Joe L. Albritton. About 1842, Matthew’s cousins, McCuin A. “Mack” Albritton and Matthew R. B. Albritton, also came to live with the family after the death of their father, McCuin Albritton, Sr. The boys, Mack and Matthew R. B., became legal wards of Allen Albritton, and their father’s property was sold off. Administrator’s Sale on the Estate of McCuin Albritton, November 21, 1943. Will be sold, on the first Tuesday in FEBRUARY next, before the Court-House door in Perry, Houston county, within the usual hours, one-half of Lot of Land No. 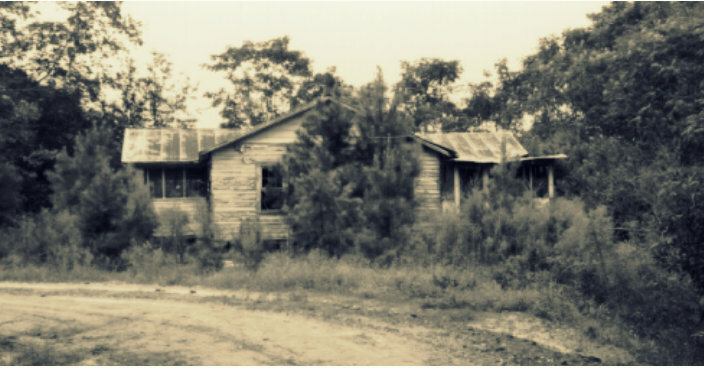 195, in the 5th District of Houston county, containing 101 1/4 acres, more or less – belonging to the Estate of McCuin Albritton, deceased, late of Burke county. Sold agreeable to an order of the Inferior Court of Burke county, when sitting for ordinary purposes. Terms cash – purchasers to pay for titles. On March 3, 1852 Matthew’s sister, Mary Jane, married Thomas M. Ray in Houston County, GA and the newlyweds moved to an area of Lowndes County that was cut into Berrien County in 1856. T. M. Ray founded a grist mill in 1863 in the southern part of Berrien County, in partnership with Levi J. Knight. This mill became the nucleus of the community now known as Ray City, GA. Some time in the 1850s, Allen Albritton moved his family to Pike County, Alabama, near the town of New Providence. Matthew, William, George, and Wright all made the move with their father, as well as their adopted cousins Matthew R.B. and Mack. At least by 1857, Matthew’s brother Littleton L. Albritton and sister Mariah Albritton had followed their sister, Mary Jane, to Berrien County, GA where Mariah married Matthew R. Grace that year. Allen Albritton established legal guardianship of Matthew R.B. and Mack Albritton in Alabama, and petitioned to be discharged from that responsibility in Georgia. Ordinary’s Office, for said County. Upon hearing the petition of Allen Albritton, Guardian of M.R.B. & M.A. 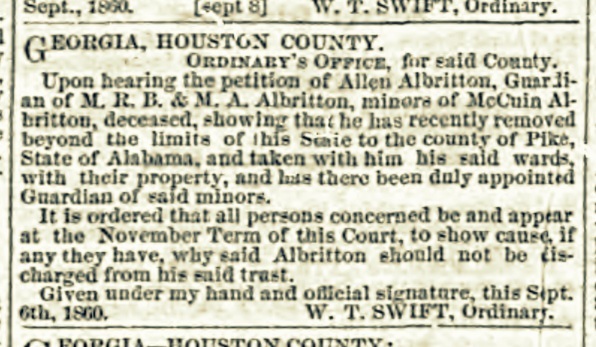 Albritton, minors of McCuin Albritton, deceased, showing that he has recently removed beyond the limits of this State to the county of Pike, State of Alabam, and take with him his said wards, with their property, and has there been duly appointed Guardian of said minors. It is ordered that all persons concerned be and appear at the November Term of this Court, to show cause, it any they have, why said Albritton should not be discharged from his said trust. Given under my hand and official signature, the Sept. 6th, 1860. In the Census of 1860, Matthew Albritton and his family were enumerated in Pike County, Alabama. Matthew, his brother William, and adopted brothers and cousins Matthew R.B, and Mack were all working the family farm. Their father and guardian, Allen Albritton, had $23,775 in his personal estate and another $9,000 in real estate. About 1861, Matthew left the farm in Alabama and joined his brother and sister in Berrien County, GA. 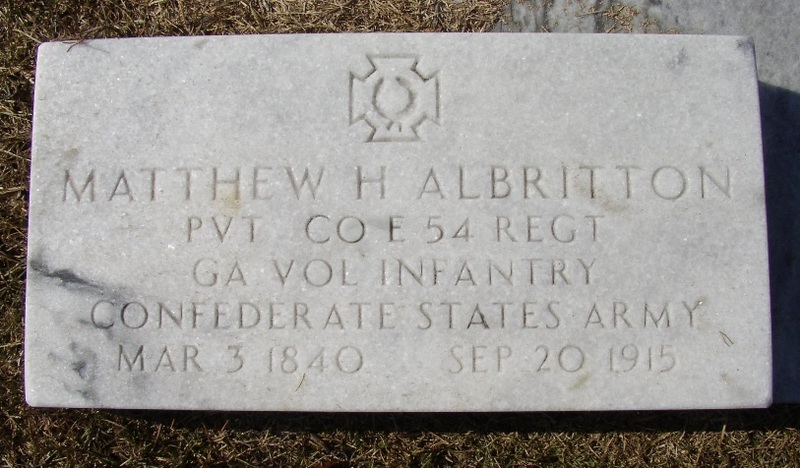 In May of 1862, Matthew’s brother, Littleton Albritton, went to Nashville, GA where he enlisted as a sergeant in Company E, 54th Georgia Infantry Regiment,, the Berrien Light Infantry. On October 22, Matthew Albritton followed Company E to their encampment at Coffee Bluff near Savannah, GA where he enlisted as a private. 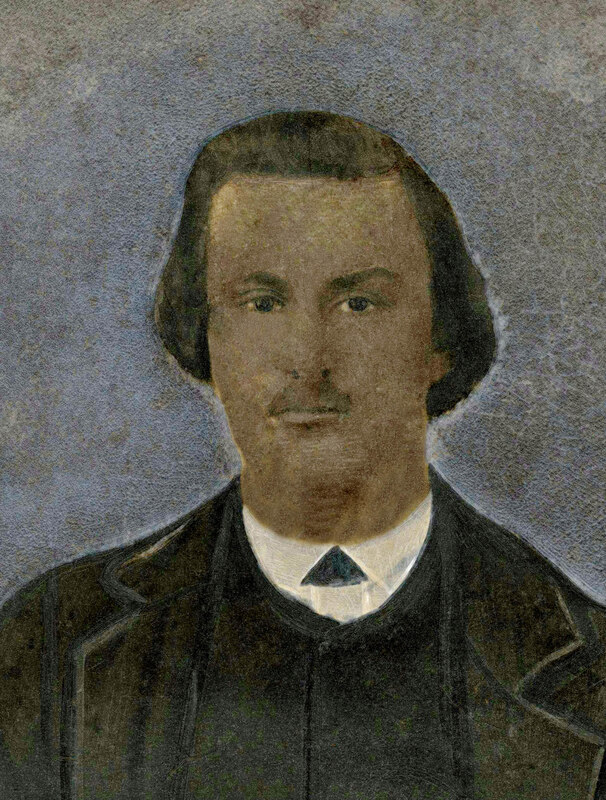 Jehu Patten, of the Rays Mill District of Berrien County, GA, served as 4th Sergeant of Company E, and other soldiers in the unit included John Lee, George Washington Knight, James Madison Baskin, William Varnell Nix, Stephen Willis Avera, William J. Lamb, Samuel Guthrie, William Henry Outlaw, and Benjamin Sirmans. During the Civil War Matthew was wounded in the throat and later received a wound to the right side. Following his injuries he was granted a furlough and returned home. In early April of 1865 he was making his way back north to rejoin his unit when he learned that General Lee had surrendered at Appomattox on April 7th. He surrendered to Federal troops near Augusta, GA. He was paroled and returned to Berrien County. Later, he would receive a pension for his service in the CSA. On November 28, 1869 Matthew Albritton was wed to Susan Catherine Byrd, the 21-year-old daughter of Nathan W. Byrd. 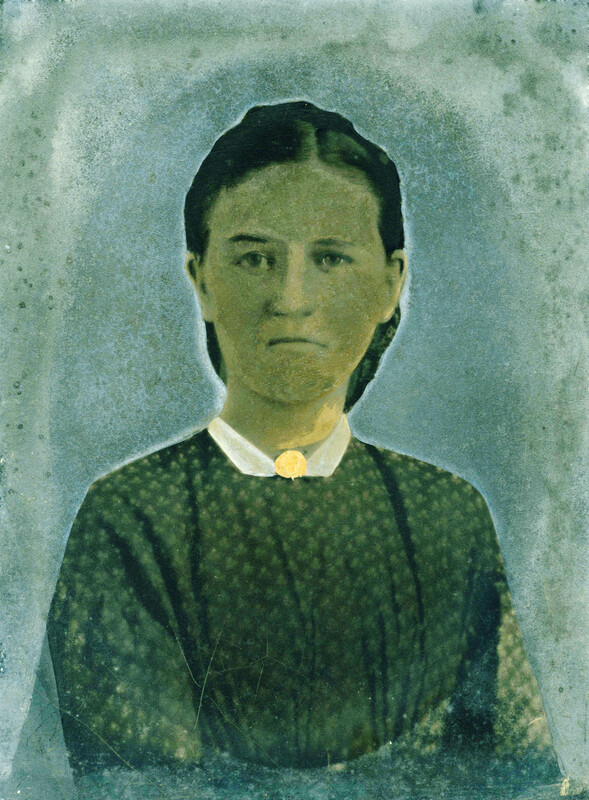 Susan Byrd’s family had moved to Nashville, GA around the end of the Civil War. Her father was a farmer and also a mail carrier on the route between Nashville and Milltown (now Lakeland), GA.
Matthew Hodge Albritton lived for many years at Nashville, GA, and later bought a farm home in the Lois Community, just west of Ray City, GA. 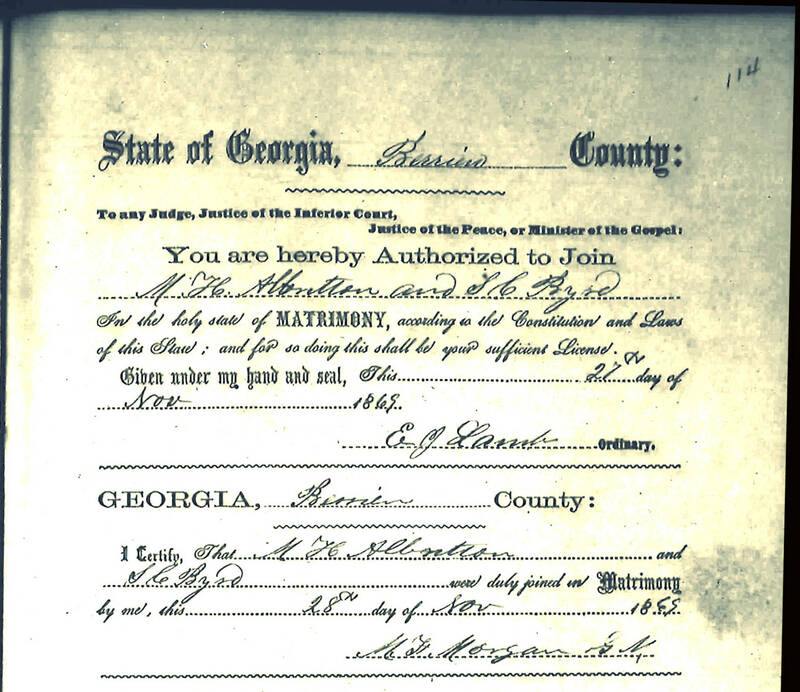 Marriage certificate of Matthew Hodge Albritton and Susan Catherine Byrd. Matthew and Susan were married for 13 years before her death on March 2, 1882. Theophilus Theodorea Albritton, born January 07, 1871. Tula Albritton, born 1874; married Lacy Lester Shaw. Mary Jane Albritton, born July 07, 1876; married Luther Americus Webb. Sophronia Albritton, born September 22, 1878; married William Guilford Devane. Matthew Allen Albritton, born January 28, 1881. Three years later, on July 16, 1885 Matthew, now 43, married again, this time to 27 year old Laura A. Myers of Nashville, GA. This was her first marriage. The couple had five children. Rena Albritton, born March 20, 1886 in GA.
Rebecca L. Albritton, born September 17, 1888 in GA.
Nona Hortense Albritton, born May 6, 1891 in GA.
Matthew Albritton died September 20, 1915 and is buried at Pleasant Cemetery near Ray City, Berrien County, Georgia. Laura Myers Albritton died April 9, 1921. She was buried in Pleasant Cemetery. Continuing with research on Nathan W. Byrd, we find his daughter, Susan Catherine Byrd, married Mathew H. Albritton and lived in the vicinity of Ray’s Mill, GA. In 1860, prior to coming to Berrien County, Nathan Byrd and his family were enumerated in Coffee County, living near the village of Bird’s Mill. What is the Byrd/Bird connection? Bird’s Mill has become a ghost town, with virtually no modern reference to its former location. The census records of 1860 tell us a post office was located there. The 1860 Gazetteer of Georgia identifies Bird’s Mill as one of five communities then extant in Coffee county. 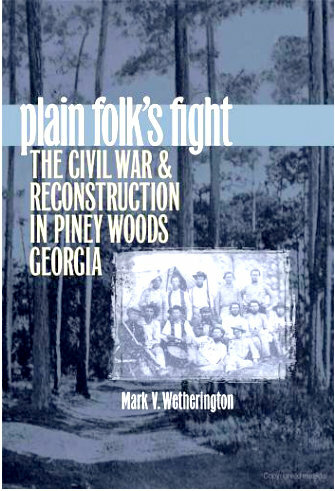 Mark V. Wetherington gives additional details in his work, Plain folk’s fight: the Civil War and Reconstruction in Piney Woods Georgia.